The little one just looked on. Not a word. Not an emotion. Just a blank stare. Had he been a grown up, it would have been an uncomfortable scene. But here it was just a kid getting asked a question in familiar tongue by a stranger. On the highest terrace of Pari Mahal if you feel like having water and you do manage to find the local watering hole, a rusty old tap, the water you are likely to taste comes straight from the mountains. Here standing next to the tap my Chachi tried rather unsuccessfully to strike a conversation with a little Muslim kid. Her daughters, my little nieces, looked on, a bit embarrassed and a bit amused. A young woman approached with a broad open smile, her voice full of joy, of life. She reminded me of Posha. I have met these women. Heard about them. Common Kashmiri Muslim women: they don't hold back. Taez- Balai. Fast. Talk, emotions, tone, laugh, scream, cry, love, they are always beaming with a certain energy. This was no woman. She was a girl. The quick question. A quick answer. And then they talked about this and that. About children. In the summer of 1990 my Chachi's family moved to a room in Udhampur. I couldn't understand why would anyone choose to live in Udhampur when everyone was living in Jammu. I came to answers slowly. And the answer was just too simple. Jammu was full. The great theater had no tickets left. Those who arrived late found the entry really tough, there were people already watching the show sitting in aisle. For a few month stay, for some families, having to undergo discomfort and humiliation in Jammu was just out of the question. When months became years, question was not a option. Some years later, at the time of her marriage the Baraat came all the way to Udhampur from Jammu. Her brother now have places of their own in Jammu. My Chachi's family had moved to the new locality of Jawahar Nagar in the late 1970s. A lot of Pandit families, including my mother's family, had moved to new locations, more modern developed localities, in the 70s and the early 80s. In these places often the interaction between Pandits and Muslims was low. It was going to take time to built new relations, new friendships and new enemies. My mother still remembers a certain Khatees Ded, an old Kashmiri Muslim lady who cried her heart out, holding onto my Nana's arm, the day he moved from old neighbourhood of Kralkhod to a new locality - Chanpore. My mother makes it sound quite dramatic - 'The entire neighborhood came to see us off. Khatees Ded kept crying. She had raised my father. Took care of him when he was young. He was like a son to her. He grew up in her lap.' The scene must have made quite on impact on her. From her stories I can say it wasn't a perfect place with the perfectly peaceful people, a paradise of angels, it was more of an earth with real people, but people who knew each other for just too long. Had I, by choice, ever moved out to a new world, the woman in my case could have been Posha, daughter of old lady Mogul who had a Yendir in her little wooden balcony. Posha who yelled 'Aazadi' in those processions whose pictures unsettle some, not many. Posha whose little son miles away from home didn't reply to 'T'che kya chuy Naav?' while sitting among strangers . Posha my little caretaker. We tell our stories to anyone. My grandfather reminds a security man that he used to live in Kashmir. While he talks, my father checks on his pulse. 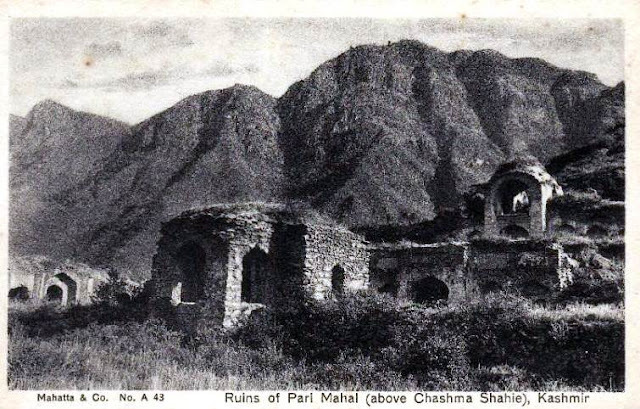 Strange tales are told of the Pari Mahal, of the wicked magician who spirited away kings' daughters in their sleep, how an Indian princess by the order of her father brought away a chenar leaf to indicate the abode of her seducer, and how all the outraged kings of India seized the magician. Today was a nice one. I feel the truth in the story as being kashmiri it touched me as (NICKA). We need a social circles from both the communities who can help both Pandith and muslim families to come back to home (KASHIR). The political thing is useless.